All products are in Canadian dollars. 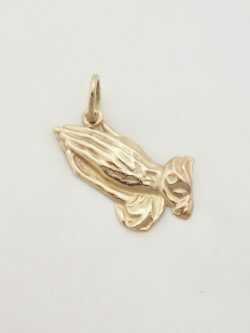 An adorable 14k yellow gold charm of praying hands is an expression of fidelity and loyalty to one's faith. The physical ritual of putting one's hands together in prayer can help calm a busy mind to focus on the higher power. An 18inch* 14k yellow gold chain IS included but NOT shown. Length of Charm: 21mm* Width of Charm: 25mm* Total Length of Charm: 26.5mm* *all measurements are approximations. All products are in Canadian dollars. 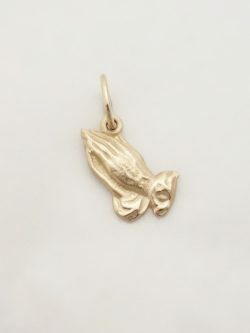 An adorable 14k yellow gold charm of praying hands is an expression of fidelity and loyalty to one's faith. The physical ritual of putting one's hands together in prayer can help calm a busy mind to focus on the higher power. An 18inch* 14k yellow gold chain IS included but NOT shown. Length of Charm: 13mm* Width of Charm: 14mm* Total Length of Charm: 18 mm* *all measurements are approximations. All prices are in Canadian dollars. 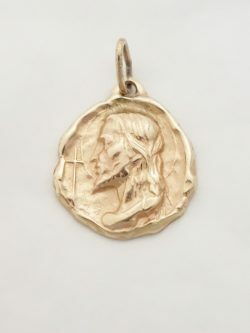 A solid 14k Jesus medal would be a great gift for anyone devoted to Christ . A 14k yellow gold 20inch* chain IS included but NOT shown. Diameter of Medal: 23mm* Total Length of Medal: 33mm* *all measurements are approximations. All prices are in Canadian dollars. 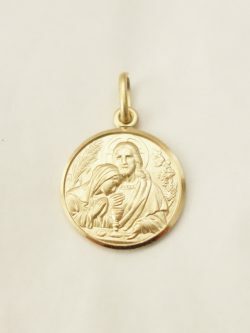 A solid 14k Jesus medal would be a great gift for anyone devoted to Christ . A 14k 18inch* chain IS included but NOT shown. Diameter of Medal: 19mm* Total Length of Medal: 28mm* *all measurements are approximations. All prices are in Canadian dollars. 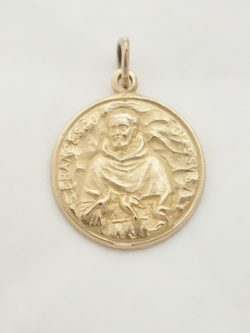 A solid 14k St. Francis of Assisi medal would be a great gift for anyone who is devoted to the Saint or with the name Francis/Frank/Francesco/Francesca. A chain IS included but NOT shown. Diameter of Medal: 21mm* Total Length of Medal: 29mm* *all measurements are approximations. All prices are in Canadian dollars. 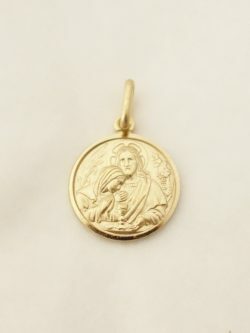 A 14k Madonna medal would be a great gift for anyone devoted to the Madonna. Chain NOT included. Diameter of Medal: 24mm* Total Length of Medal: 33mm* *all measurements are approximations. All prices are in Canadian dollars. 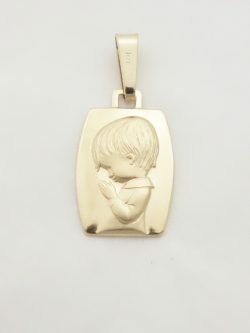 A solid 14k yellow gold medal has a young boy praying. It was made in Italy. Chain NOT included. Length of Medal: 18 mm* Width of Medal: 13.5mm* Total Length of Medal: 30 mm* *all measurements are approximations. All prices are in Canadian dollars. A solid 14k medal would be a great gift for a baby or an adult. It was made in Italy. Chain NOT included. Diameter of Medal: 18 mm* Total Length of Medal: 26 mm* *all measurements are approximations. All prices are in Canadian dollars. A solid 14k medal would be a great gift for a baby or an adult. It was made in Italy. Chain NOT included. Length of Medal: 13 mm* Width of Medal: 11 mm* Total Length of Medal: 18 mm* *all measurements are approximations. All prices are in Canadian dollars. 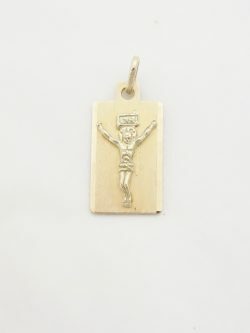 A 14k religious medal that has a crucifix on a tag. A great gift to give for a religious event (baptism, communion, confirmation). Made in Italy;. Chain NOT included. Length of Medal: 21.5mm* Width of Medal: 16mm* Total Length of Medal: 26.5mm* *all measurements are approximations. All prices are in Canadian dollars. 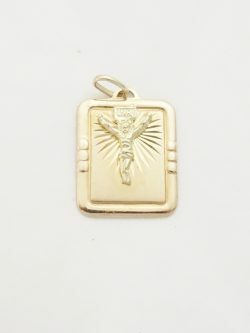 A 14k religious medal that has a crucifix on a tag. 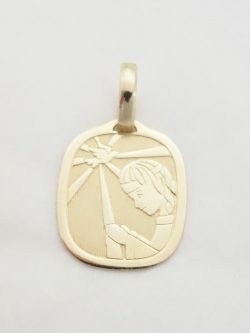 A great gift to give for a religious event (baptism, communion, confirmation). Made in Italy. Chain NOT included. Length of Medal: 21.5mm* Width of Medal: 11mm* Total Length of Medal: 26mm* *all measurements are approximations. All prices are in Canadian dollars. 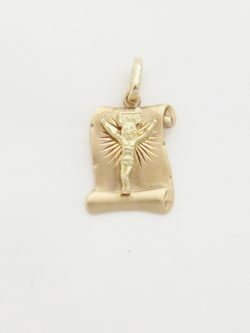 A 14k religious medal that has a crucifix on a tag. 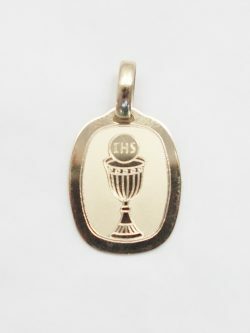 A great gift to give for a religious event (baptism, communion, confirmation). Made in Italy;. Chain NOT included. Length of Medal: 20mm* Width of Medal: 15.5mm* Total Length of Medal: 29mm* *all measurements are approximations. All prices are in Canadian dollars. 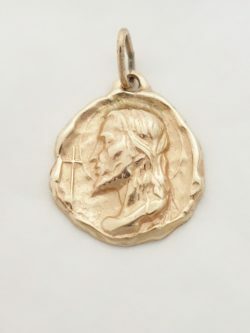 A 14k religious medal that has a crucifix on a tag. A great gift to give for a religious event (baptism, communion, confirmation). Made in Italy. Chain NOT included. Length of Medal: 24mm* Width of Medal: 17mm* Total Length of Medal: 31mm* *all measurements are approximations. All prices are in Canadian dollars. 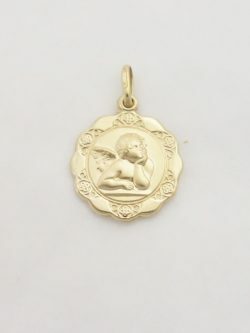 A 14k angel medal would be a great gift for anyone. A guardian angel watches over the wearer of this priceless treasure. The medal was made in Italy. Chain NOT included. Diameter of Medal: 17mm* Total Length of Medal: 24mm* *all measurements are approximations. All prices are in Canadian dollars. 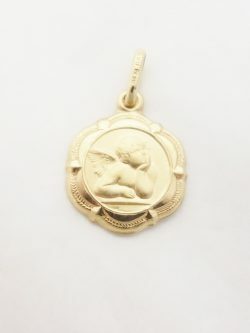 A 14k angel medal would be a great gift for anyone. A guardian angel watches over the wearer of this priceless treasure. The medal was made in Italy. Chain NOT included. Diameter of Medal: 13.5mm* Total Length of Medal: 22mm* *all measurements are approximations. All prices are in Canadian dollars. 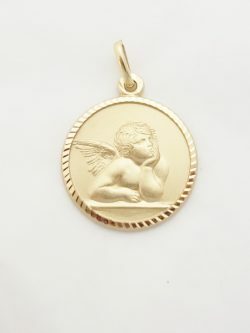 A 14k angel medal would be a great gift for anyone. A guardian angel watches over the wearer of this priceless treasure. The medal was made in Italy. Chain NOT included. Diameter of Medal: 12mm* Total Length of Medal: 19mm* *all measurements are approximations. All prices are in Canadian dollars. A 14k Scapular medal has Jesus on one side and the Madonna on the other. Chain NOT included. Diameter of Medal: 18mm* Total Length of Medal: 28mm* *all measurements are approximations. All prices are in Canadian dollars. 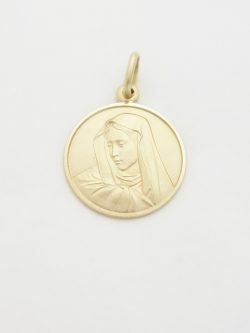 A solid 14k Madonna medal would be a great gift for anyone devoted to the Madonna. A 14k 18inch* chain IS included but NOT shown. Diameter of Medal: 17.5mm* Total Length of Medal: 37.5mm* *all measurements are approximations. All prices are in Canadian dollars. 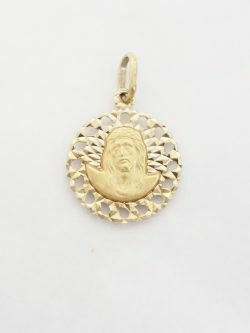 A solid 14k Madonna medal would be a great gift for anyone devoted to the Madonna. The medal was made in Italy. Chain NOT included. Diameter of Medal: 20mm* Total Length of Medal: 30mm* *all measurements are approximations. All prices are in Canadian dollars. 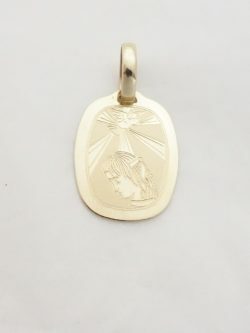 A solid 14k Madonna medal would be a great gift for anyone devoted to the Madonna. The medal was made in Italy. Chain NOT included. Diameter of Medal: 14mm* Total Length of Medal: 21mm* *all measurements are approximations. All prices are in Canadian dollars. 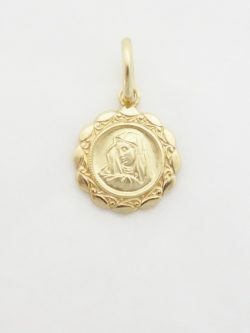 A 14k Madonna medal would be a great gift for anyone devoted to the Madonna. The medal was made in Italy. Chain NOT included. Diameter of Medal: 13.5mm* Total Length of Medal: 22.5mm* *all measurements are approximations. All products are in Canadian dollars. 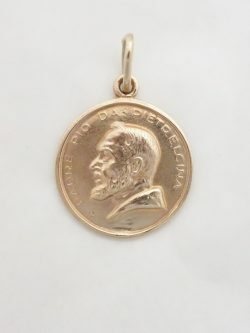 A solid 14k Padre Pio medal would be a great gift for anyone who is devoted to the Saint. A 14k 18 inch* chain IS included but NOT shown. Diameter of Medal: 18 mm* Total Length of Medal: 27.5 mm* *all measurements are approximations. All prices are in Canadian dollars. 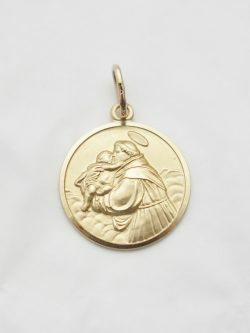 A solid 14k medal that has St. Anthony on one side and St. Francis on the other. 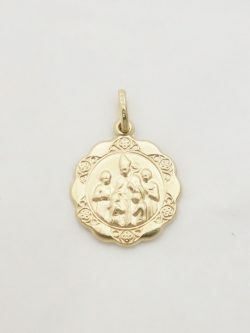 This would be a great gift for anyone who is devoted to these Saints. An 18 inch* 14k chain IS included but NOT shown. Length of Medal: 24.5 mm* Width of Medal: 15 mm* Total Length of Medal: 30 mm* *all measurements are approximations. All prices are in Canadian dollars. 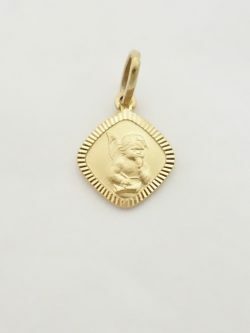 A charming 14k solid yellow gold Confiirmation charm. A lovely keepsake to give to someone to remember their special day. Made in Italy. Chain NOT included. Length of Medal: 21mm* Width of Medal: 16mm* Total Length of Medal: 28.5mm* *all measurements are approximations. All prices are in Canadian dollars. 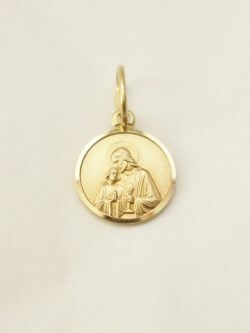 A charming 14k solid yellow gold Confirmation charm. A lovely keepsake to give to someone to remember their special day. Made in Italy. Chain NOT included. Diameter of Medal: 16 mm* Total Length of Medal: 23.5mm* *all measurements are approximations. All prices are in Canadian dollars. 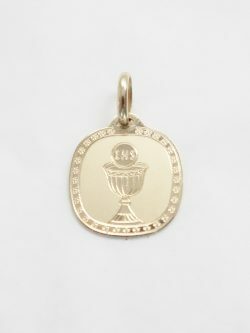 A charming 14k solid yellow gold First Holy Communion charm has a picture of a chalice and the host, two symbols of the Holy Communion. A lovely keepsake to give to someone to remember their special day. Made in Italy. Chain NOT included. Diameter of Medal: 16 mm* Total Length of Medal: 23.5mm* *all measurements are approximations. All prices are in Canadian dollars. 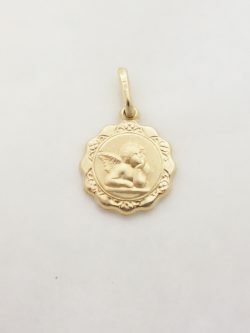 A charming 14k solid yellow gold Confirmation charm. A lovely keepsake to give to someone to remember their special day. Made in Italy. Chain NOT included. Length of Medal: 21mm* Width of Medal: 17mm* Total Length of Medal: 28mm* *all measurements are approximations. All prices are in Canadian dollars. 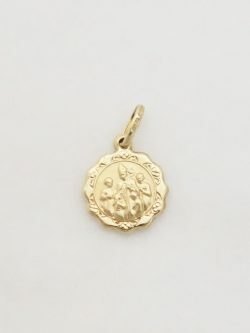 A charming 14k solid yellow gold First Holy Communion charm has a picture of a chalice and the host, two symbols of the Holy Communion. A lovely keepsake to give to someone to remember their special day. Made in Italy. Chain NOT included. Length of Medal: 21mm* Width of Medal: 16mm* Total Length of Medal: 28mm* *all measurements are approximations. All prices are in Canadian dollars. 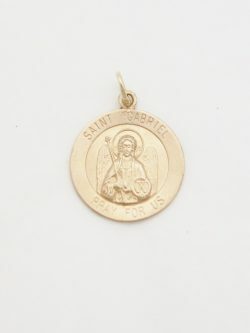 A solid 14k St. Gabriel medal would be a great gift for anyone who is devoted to the Saint or with the name Gabriel. A 14k 18 inch* chain is included but NOT shown. Diameter of Medal: 18 mm* Total Length of Medal: 25mm* *all measurements are approximations. All prices are in Canadian dollars. 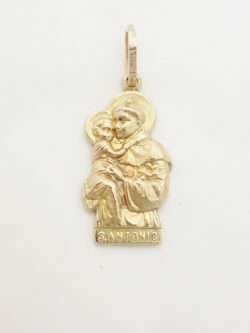 A solid 14k St. Anthony medal would be a great gift for anyone who is devoted to the Saint or with the name Anthony. "S. Antonio Prega per Noi" is on the back which is Italian for 'St. Anthony Pray For Us'. Chain NOT included. Length of Medal: 28mm* Width of Medal: 15mm* Total Length of Medal: 36mm* *all measurements are approximations. All prices are in Canadian dollars. 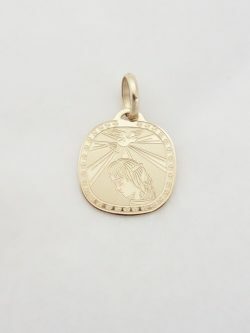 A 14k confirmation medal would be a great gift for any boy or girl as a keepsake for their confirmation. The medal was made in Italy. It has “Ricordo Della Cresima” on the back which is Italian for 'Confirmation Keepsake'. Chain NOT included. Diameter of Medal: 12mm* Total Length of Medal: 19mm* *all measurements are approximations. All prices are in Canadian dollars. 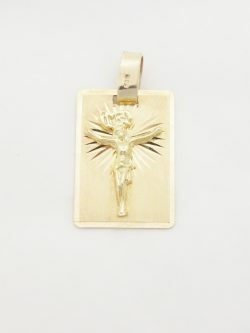 A 14k confirmation medal would be a great gift for any boy or girl as a keepsake for their confirmation. The medal was made in Italy. It has "Ricordo Della Cresima" on the back which is Italian for 'A Confirmation Keepsake'. Chain NOT included. Diameter of Medal: 17mm* Total Length of Medal: 24mm* *all measurements are approximations. All prices are in Canadian dollars. 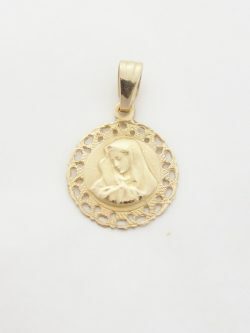 A solid 14k first communion medal would be a great gift for any boy or girl as a keepsake for their first holy communion. The medal was made in Italy. Chain NOT included. Diameter of Medal: 12mm* Total Length of Medal: 21mm* *all measurements are approximations. All prices are in Canadian dollars. A solid 14k first communion medal would be a great gift for any boy or girl as a keepsake for their first communion. The medal was made in Italy. It has "Ricordo Della Prima Comunione" on the back which is Italian for 'A First Communion Keepsake'. Chain NOT included. Diameter of Medal: 18mm* Total Length of Medal: 26mm* *all measurements are approximations. All prices are in Canadian dollars. A solid 14k first communion medal would be a great gift for any boy or girl as a keepsake for their first communion. The medal was made in Italy. It has "Ricordo Della Prima Comunione" on the back which is Italian for 'A First Communion Keepsake'. Chain NOT included. Diameter of Medal: 16mm* Total Length of Medal: 24.5mm* *all measurements are approximations. All prices are in Canadian dollars. 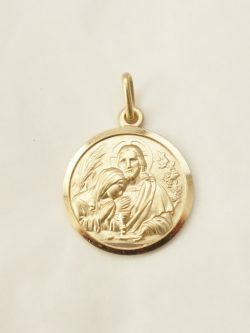 A solid 14k first communion medal would be a great gift for any boy or girl as a keepsake for their first communion. The medal was made in Italy. It has "Ricordo Della Prima Comunione" on the back which is Italian for 'A First Communion Keepsake'. Chain NOT included. Diameter of Medal: 14mm* Total Length of Medal: 21.5mm* *all measurements are approximations. All prices are in Canadian dollars. 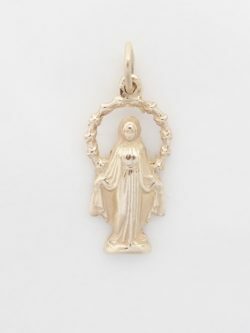 A solid 14k Miraculous medal would be a great gift for anyone who is devoted to the Madonna. Also known as the medal of the Immaculate Conception, it has the Madonna standing on a globe with the head of the serpent under her feet. 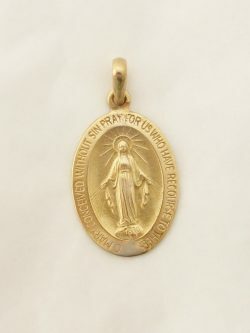 The front of the medal, circling the oval shaped medal are the words "O Mary, conceived without sin, pray for us who have recourse to thee." On the back of the medal, there are twelve stars (the 12 Apostles that surround a large "M" (Mary) from which a cross arises ( Jesus' cross of Redemption)). Below the "M", the medal depicts two flaming hearts. The left heart, circled with thorns, represents Jesus (The Sacred Heart, who died for our sins). The right heart, pierced by a sword, symbolizes Mary (The Immaculate Heart, who intercedes for us). The flames symbolize the burning love Jesus and Mary have for us. This treasure was made in Italy. Chain NOT included. Length of Medal: 32.5 mm* Width of Medal: 21mm* Total Length of Medal: 38.5mm* *all measurements are approximations. All prices are in Canadian dollars. 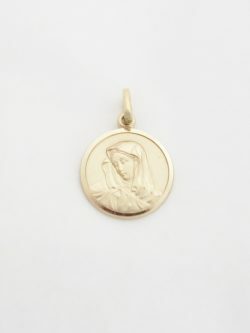 A solid 14k Miraculous medal would be a great gift for anyone who is devoted to the Madonna. Also known as the medal of the Immaculate Conception, it has the Madonna standing on a globe with the head of the serpent under her feet. The front of the medal, circling the oval shaped medal are the words "Regina Sine Labe Originali Concepta O.P.N." These words mean "O Mary, conceived without sin, pray for us who have recourse to thee." On the back of the medal, there are twelve stars (the 12 Apostles that surround a large "M" (Mary) from which a cross arises ( Jesus' cross of Redemption)). Below the "M", the medal depicts two flaming hearts. The left heart, circled with thorns, represents Jesus (The Sacred Heart, who died for our sins). The right heart, pierced by a sword, symbolizes Mary (The Immaculate Heart, who intercedes for us). The flames symbolize the burning love Jesus and Mary have for us. This treasure was made in Italy. Chain NOT included. Lengthof Medal: 21.5 mm* Width of Medal: 14 mm* Total Length of Medal: 27 mm* *all measurements are approximations. All prices are in Canadian dollars. 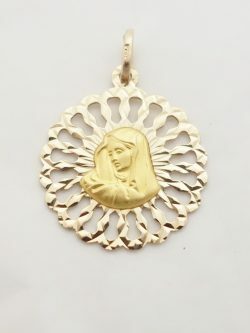 A solid 14k Miraculous medal would be a great gift for anyone who is devoted to the Madonna. 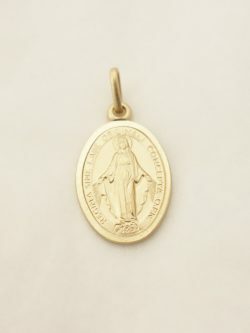 Also known as the medal of the Immaculate Conception, the front has the Madonna with a halo around her head. On the back of the medal, there are twelve stars (the 12 Apostles that surround a large "M" (Mary) from which a cross arises ( Jesus' cross of Redemption)). Below the "M", the medal depicts two flaming hearts. The left heart, circled with thorns, represents Jesus (The Sacred Heart, who died for our sins). The right heart, pierced by a sword, symbolizes Mary (The Immaculate Heart, who intercedes for us). The flames symbolize the burning love Jesus and Mary have for us. A 14k 18inch* chain IS included but not shown. Lengthof Medal: 22mm* Width of Medal: 10.5mm* Total Length of Medal: 26mm* *all measurements are approximations. All prices are in Canadian dollars. 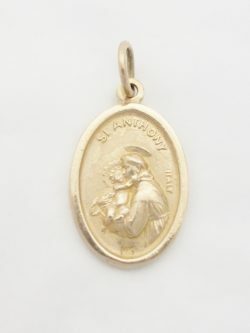 A solid 14k St. Anthony medal would be a great gift for anyone who is devoted to the Saint or with the name Anthony. The medal was made in Italy. Chain NOT included. Diameter of Medal: 20 mm* Total Length of Medal: 29 mm* *all measurements are approximations.